With a smoothie you can easily get an extra portion of fruit and vegetables. Experts explain how you make this healthy drink yourself. 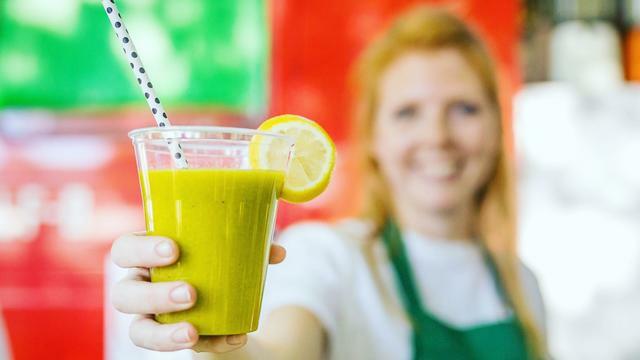 "Smoothies have been very popular for some time, both with fruit and with vegetables," says Marleen Vriesenga, owner of a juice and smoothie bar in the center of Utrecht. "You see smoothies on the menu more and more often in lunchrooms." Smoothies come in all sorts of variations. Maurits Schuijf travels throughout the country with his mobile smoothie bar. "At events we often serve three common types: a creamy, a fresh-sour and a very sweet one. Not everywhere in the Netherlands people are used to smoothies. In those places, especially the sweet variety does well." Vriesenga: "My card changes with the seasons, but two combinations always remain: the orange-ginger and the green lean-green. The latter in particular is very suitable for beginners. You do have a green smoothie with spinach, but because of the the addition of fruit is nice and sweet. " Schuijf recognizes that. "Our mango green with spinach and lots of mango is indeed popular." New combinations are coming from the United States. This way Schuijf sees that there are more superfoods in recipes. "Goji berries or spirulina for example, or matcha powder. Not all superfoods are good to eat like this, but throw them in the blender and you still get them." In addition, juices are becoming increasingly popular. Vriesenga: "Have you ever tried sellery juice ? Pure celery juice , good for moisture wicking, for the skin and for those who want to lose weight. Not necessarily tasty, but healthy." Schuijf: "I didn't have to get used to celery juice as long as I expected. After two days it went well." Another trend is the ginger shot. "Certainly in the winter, it makes you nice and warm," says Vriesenga. "They also call this shot the healthy espresso, your engine will start this in the morning. But the steam comes out of your ears." Sweet? Then mix vegetables with a piece of fruit. Extra cold? Add an ice cube or use frozen fruit. Blending like a professional? Add ingredients in layers and check in advance whether the blender is strong enough for ice cubes and frozen fruit. Those who want to get started in the kitchen can choose between the blender and the slowjuicer. "They are really two different devices," Vriesenga explains. "With the slowjuicer you get juice, this is very suitable for hard fruits and vegetables such as carrot and celery. With the blender you get a thicker mix and the more nutritious smoothies." Schuijf: "With juice you obviously miss the fibers, they are out." Maaike de Leeuw of the National Action Plan Fruit & Vegetables agrees: "Drinking fruit and vegetables saturates less than eating fruit and vegetables. Smoothies and juices do not count towards your daily portion. But if you opt for a smoothie, make it then one yourself. " Whichever type is preferred, experimenting with flavors is the best, according to the experts. "Start simply, with orange juice and a banana", Schuijf notes. "You can then add anything to it. Pineapple and coconut milk, for example. Or a lime." Vriesenga: "I actually like everything and mix a lot. Choose up to five ingredients, otherwise you won't taste them anymore." You can also try an unknown vegetable. De Leeuw: "This month you will find Kalettes in the store, a kind of cabbage rosettes with curly, purple-green leaves. It is a cross between kale and Brussels sprouts. Kalettes have a sweet, nutty taste and are rich in vitamins, minerals and fibers. Great for a smoothie. " Vriesenga uses the sweetest juice as a liquid. "But not from a pack, then again sugars and E-numbers come with it." Schuijf: "Water also works and is the best option in terms of calories. But this makes your drink more watery. If you prefer a creamy variety, then add coconut milk, yogurt or an avocado." He does not need to follow a recipe exactly. "Some ingredients are more essential than others. Don't you like matcha powder? Just don't add it." Add the ingredients in layers to the blender. This way the blender does not get overheated and all the ingredients are nicely mixed into a smooth smoothie. Start with the liquid. Then add the leafy vegetables and finally the fruit. Blend to a low setting, increase the speed and blend for approximately thirty seconds.